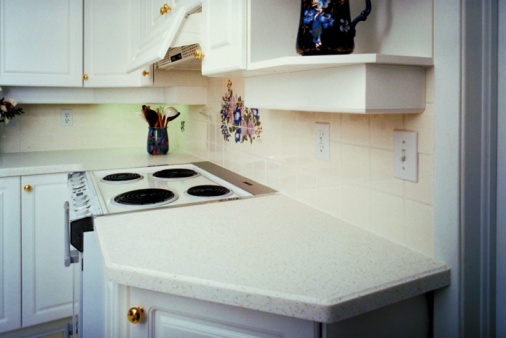 Formica countertops are made of a thin layer of this laminate over a particle board. It is an economical covering compared to other surfaces, and very durable, not scratching or chipping easily. If you have Formica counters, but have decided that you prefer a new design, you can glue down new sheets of this trademarked laminate over the existing surface to give your kitchen a brand new look. The easiest way to install new Formica is with a Formica sheet kit. Wash the surface of the countertops thoroughly with a kitchen cleaner and degreaser to remove buildup and debris. Dry it off completely and then let it sit for an hour to ensure that it is dry. Measure the countertop surface to determine the depth and length. Transfer these measurements to the new laminate sheets contained in the Formica kit. Mark the measurements on the back and draw lines for cutting. Cut out a sheet of laminate with a carbide tip blade. Use a straight edge to help guide the blade if you are concerned about the knife slipping. Measure the height of the countertop edging as well as the length of each section of countertop that needs edging pieces. Cut strips that match the height of the edges and are as long at the counter length or side. Use the carbide tip blade knife to make the edge strips. Wipe off any dust that might have settled on the counter and roll on the adhesive that comes with the re-laminating kit. Roll adhesive on the counter edge first and glue the edge strips in place so that they are even with the top edge of the counter. Once in place, roll adhesive on the top of the counter and lay the large sheet in place. Use a clean rubber roller to roll the top of the laminate to press it down and remove bubbles.